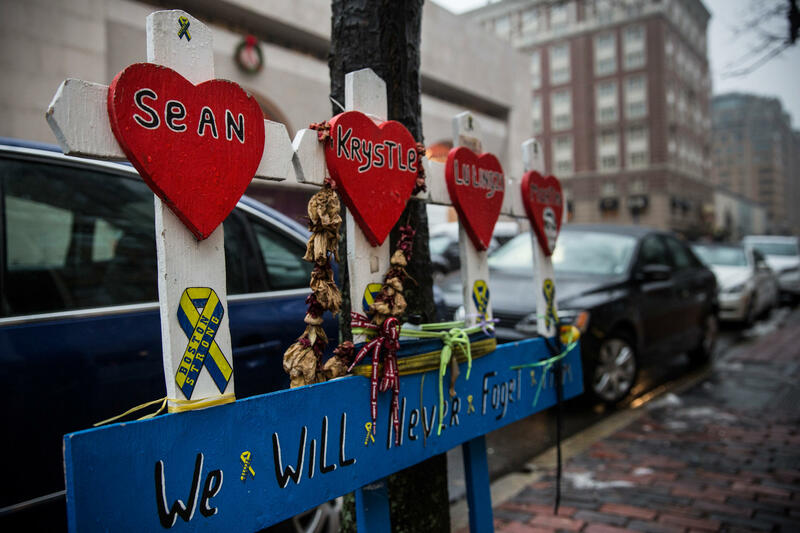 A memorial at the site of the first explosion in the Boston Marathon bombing. Defense attorneys say too many people in the potential jury pool have some kind of personal connection to the case. One potential juror wrote, "We all know he's guilty, so quit wasting everybody's time and string him up." Another put down, "They should have already killed him." Defense attorneys say that 68 percent of the nearly 1,400 people summoned in the federal death penalty trial have already decided that Tsarnaev is guilty, and about as many say they have a personal, emotional connection to the case. "I don't think it's a close call," says David Hoose, a Boston-area defense attorney. "If this case doesn't get moved, what one would get moved?" Hoose, who has handled other death penalty cases, says this one has had an exceptionally broad impact. "Virtually everyone is gonna be no more than two degrees of separation from someone who was at the scene," he says. The explosion at the marathon finish line killed three people and injured hundreds in 2013. Personal connections to the blast run the gamut, from those who were there at the marathon, to those with friends or family who were victims, to medics or police involved in the violent shootout or dramatic capture of Tsarnaev, found hiding in a boat in a suburban backyard after a massive manhunt. It's unclear where the judge, U.S. District Judge George O'Toole Jr., will draw the line. One juror wrote that her personal connection was "being a 29-year-old female just like one of the victims." Equally challenging is who should be disqualified from the jury pool for opposing the death penalty. By law, jurors have to be open to it, and many people can easily be ruled in or out. But it's less clear what to do with potential jurors who tell the judge, like one woman did, that she's categorically opposed to capital punishment — but when pressed, eventually conceded she might possibly be for it, if her own child were the victim. "There are shades of gray, and I mean, this does get confusing and muddy," Hoose says. "Some jurors do go back and forth." Defense attorneys have already unsuccessfully argued that it would be impossible to find impartial jurors in Boston, but Nancy Gertner, a former federal judge, says citing the opinions of actual potential jurors now bolsters the defense's case. "This is now basically arguing that those predictions are borne out," she says. "I mean, it's essentially saying, 'See, we were right.' "
Judge O'Toole has insisted that impartial jurors can be found here, but he's also left the door open to reconsidering. Gertner says there's good reason to doubt whether jurors can really set aside a personal connection to the bombing, even when they say they can. "The notion that you can take a bad fact, a prejudicial fact, and then easily compartmentalize it so it doesn't bleed into the rest of your view of the case — that is extraordinarily difficult," Gertner says. If Tsarnaev is ultimately convicted, jury selection is likely to be grounds for appeal. As defense attorneys wrote in making their case for a change of venue, when you screen out all jurors who oppose the death penalty, and all those with preexisting opinions on guilt or with personal connections, "those few who survive the winnowing ... will not be representative of the community," as the Constitution requires. The search for jurors in the trial of accused Boston bomber Dzhokhar Tsarnaev is taking longer than expected. Defense attorneys say it's nearly impossible to find unbiased jurors around Boston, and they are asking yet again for the judge to move the trial somewhere else. NPR's Tovia Smith reports. TOVIA SMITH, BYLINE: From the beginning, defense attorneys have argued the entire jury pool has been poisoned by what they call a narrative of guilt from a, quote, "tidal wave of media." UNIDENTIFIED MAN: Even in jail, the government says, make no mistake, Dzhokhar Tsarnaev is dangerous. UNIDENTIFIED MAN #2: ...That he knew how to build a bomb and would be happy to die a martyr. UNIDENTIFIED WOMAN: Dzhokhar Tsarnaev wrote why they targeted innocent people at the finish line. SMITH: Now Tsarnaev's lawyers say widespread bias is proven by jurors' own comments on a court questionnaire. One, for example, wrote (reading) we all know he's guilty, so quit wasting everybody's time and string him up. Another put down, (reading) they should have already killed him. Defense attorneys said that 68 percent of the nearly 1,400 summoned have already decided Tsarnaev is guilty, and about as many say they have a personal connection to the case. DAVID HOOSE: I don't think it's a close call. If this case doesn't get moved, what one would get moved? SMITH: Defense attorney David Hoose, who's handled other death penalty cases, says this one has an exceptionally broad impact. HOOSE: Virtually everyone is going to be no more than two degrees of separation from someone who was at the scene. UNIDENTIFIED MAN #3: (Unintelligible). What was that? SMITH: Personal connections to the blast run the gamut from those who were there to those with friends or family who were victims medics or police involved in the violent shootout or dramatic capture of Tsarnaev. UNIDENTIFIED MAN #4: We have a person in the boat - a live party - live party in the boat confirmed. SMITH: It's unclear where the judge will draw the line. One juror wrote her personal connection was, quote, "being a 29-year-old female, just like one of the victims." Equally challenging is who should be disqualified for opposing the death penalty. By law, jurors have to be open to it, and many can be easily ruled in or out. But what to do, for example, with the woman who told the judge she's categorically opposed to capital punishment, but when pressed, eventually conceded she might be for it maybe if her own child were the victim. HOOSE: There are shades of gray. And, I mean, this does get confusing and muddy. Some jurors do go back and forth. SMITH: While defense attorneys have unsuccessfully argued before that it would be impossible to find impartial jurors here, former federal judge Nancy Gertner says citing the opinions of actual jurors now bolsters their case. NANCY GERTNER: This is now basically arguing that those predictions are borne out. I mean, it's essentially saying, see - we were right. SMITH: The judge has insisted impartial jurors can be found here, but he's also left the door open to reconsidering. Gertner says there is good reason to doubt whether jurors can really set aside a personal connection to the bombing, even when they say they can. GERTNER: The notion that you can take a bad fact - a prejudicial fact and then easily compartmentalize it so it doesn't bleed into the rest of your view of the case - that is extraordinarily difficult -extraordinarily difficult. SMITH: If Tsarnaev is ultimately convicted, jury selection is likely to be grounds for appeal. When you screen out all jurors who oppose the death penalty and all those with pre-existing opinions on guilt or with personal connections, defense attorneys say those few who survive the winnowing will not be representative of the community as the Constitution requires. Tovia Smith, NPR News, Boston. Transcript provided by NPR, Copyright NPR.